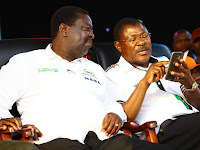 Tuesday November 6, 2018 - A section of leaders from the Luhya community have asked ANC leader, Musalia Mudavadi, and Ford Kenya’s Moses Wetang’ula to back Deputy President William Ruto's presidential bid in 2022 or retire from politics. Speaking at Malava Primary School during a fundraiser for 14 churches in the sub-county, the leaders said Mudavadi and Wetangula have failed to give direction to the Luhya community. They said Ruto has already been endorsed by President Uhuru Kenyatta and Opposition Chief Raila Odinga for Presidency in 2022. The leaders included MPs Mwambu Mabonga (Bumula), Didmus Barasa (Kimilili), Emmanuel Wangwe (Navakholo), Bernard Shinali (Ikolomani), Dan Wanyama (Webuye), John Walukhe (Sirisia), Charles Gimose (Hamisi) and Malava's Malulu Injendi. Mabonga said Luhyas must get rid of Mudavadi and Wetang'ula if the community has to "take its rightful position in national politics." “We must organise ourselves as Luhyas if we hope to move forward because Mudavadi and Wetang’ula have failed to give the community political direction,” he said. Barasa on his part said Mudavadi and Wetang'ula lack the political experience and knowledge to run Government and should support Ruto for President. “We have no problem with our own becoming President but we know that Ruto’s match to Presidency is unstoppable. Those opposing it are wasting their time,” he said.